SPW053455 SCOTLAND (1937). General view, Springboig, Glasgow, Lanarkshire, Scotland, 1937. An oblique aerial photograph, taken facing east. 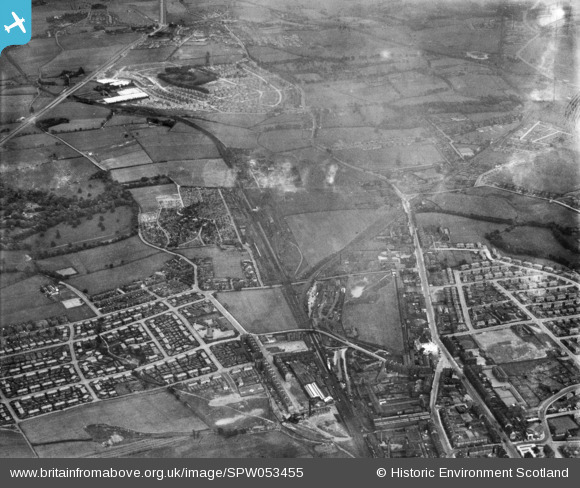 Pennawd [SPW053455] General view, Springboig, Glasgow, Lanarkshire, Scotland, 1937. An oblique aerial photograph, taken facing east. Sandymount Cemetery has an area of some 28.6 acres, with 7,450 meteres of roadways and paths. The cemetery is laid out into compartments, the earliest being the Victorian section. These compartments arranged alphabetically from north to south. There is a Jewish burial ground accessed from Hallhill Road which has been subject to regeneration. There is also a small Muslim section in the north east corner. Interestingly there is a head stone for a Francis Kelly, Congressional Medal of Honor Recipient. As a United States Navy serviceman, he was awarded for extraordinary heroism and uncommon valor in action in connection with the sinking of the U.S.S. Merrimac at the entrance to the harbor of Santiago de Cuba, June 2, 1898, Spanish-American War. Despite heavy fire from the Spanish batteries, Watertender Kelly displayed extraordinary heroism throughout this operation. R.I.P. Shettleston Rd from here, early 1900s. Queue for the Saturday morning matinee, Amulree St, Shettleston 1955. JT Boyds at Earnside Street. Railway Bridges at Gartocher Rd. Budhill Square, opposite Shettleston Station. Roundabout here El Paso (later) Caravel pub. Demolished due to some suspicious circumstances.